I finally figured out a place to hike tonight. My friend invited me to hike in Zion’s with her and her husband. There is supposed to be a strawberry moon, which I had never heard of or seen before. So she sent me a list on stuff I would need, things like water, a flashlight, good shoes, and a change of clothes in case it got cold. I set out to find these items I didn’t have, taking a friend along with me for the ride. We went to the grocery store first to get some water and a flashlight, I ended up finding a really cool head light ( easier than carrying in my hand ). I don’t know if it was coincidence or just a small town, but I ended up seeing the same friends I was going to go hiking with at the store picking up some food. We chatted for a little then continued on our way. While leaving the store my friend and I decided to grab some food. I had never been to this restaurant named The Rocking V.
I had heard that it was good but expensive, but he insisted, so off we went. While walking in you first notice the artwork that is displayed all over the place (which is also for sale!). We were greeted promptly and shown to our seats. The seats were very comfy, and would be very appealing to someone who had been exploring the city or hiking all day. We both ordered strawberry daiquiris to drink which were amazing!! 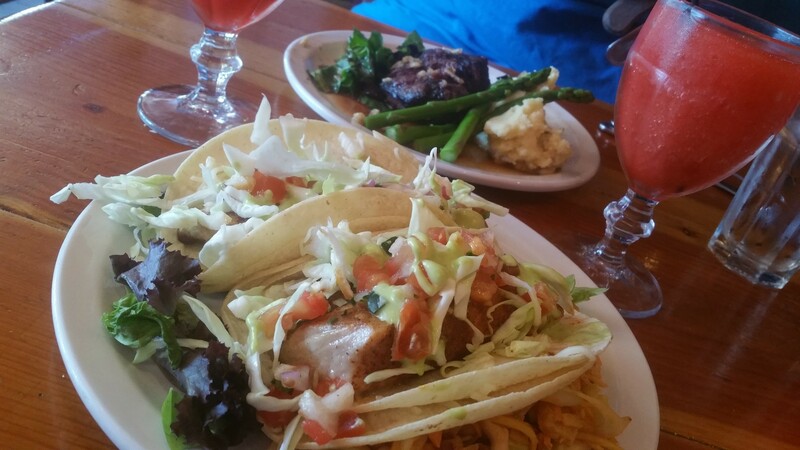 I ordered the Smoked Trout Fish Tacos and he got the Filet Mignon. Both orders came with a soup of the day which was Roasted Tomato Basil and Mesquite Red Bean with Wild Boar Bacon. They were absolutely delicious! The tomato soup had a very deep flavor, not too much tomato and not too little basil. It was perfectly balanced, plus we were having a great time from the drinks as well! As we finished our soups our food came out. I was surprised at how fast of service we were getting, even though the whole place was packed! Our food look gorgeous! It tasted even better. My fish had a southwestern flavor that went perfectly with the tangy cilantro line sauce they used. I didn’t get to taste his food, but he kept saying every couple of bites how good it was! Our server was very friendly and added to the whole experience. Making great conversation, never rushing us, and laughing along with our funny jokes! It made other restaurant experiences I have had look dull in comparison. I forgot to mention, along with the great artwork downstairs, we were informed that there was an art gallery upstairs too! we didnt get a chance to see it, but maybe i will go back to have dinner again and get a look! here is a link to the website of the restaurant! check it out!